Every bottle of Rolling Rock comes with a ‘33’ on its back. And since the very beginning, there has been speculation about what it means. Is it some kind of secret code? Is it a simple mistake? Nobody knows. But what we do know is that there are lots of people out there interested in what ‘33’ could mean. Call them conspiracy theorists, if you will. But here are some of the most popular ideas about ‘33’. 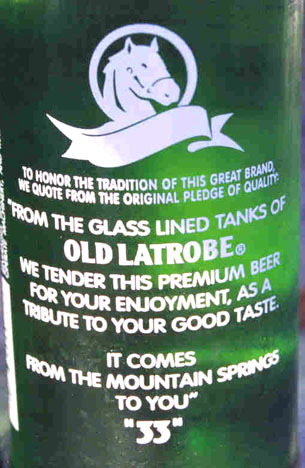 Origins: Rolling Rock is a well-loved gentle-spirited beer produced by a small Pennsylvania brewery that survived for a very long time as an independent before being bought out by Labatts in 1987. Over the years, this brew has gained widespread acceptance, becoming one of the few regional beers to carve a niche in the nationwide market. As it spread to new markets, the mystery surrounding the appearance of a cryptic ’33’ on its label spread with it. The mysterious ’33’ has been on the Rolling Rock label since the beer’s debut in 1939. One would think finding out where the ’33’ came from would amount to little more than a bit of digging in the file room of that brewery. Unfortunately, if the real reason for the name was at one time set down in the records of the company, it’s long gone now. It took 33 steps to get from the brewmaster’s office to the brewing floor. It’s the number of the racing horse pictured on the label. The owner bet $33 on a horse (#33, of course) and bought the brewery with the proceeds in 1933. There are 33 streams feeding into the reservoir from which the brewery draws its water. Groundhog Day is the 33rd day of the year, and they make a big fuss over that holiday in Pennsylvania. The number of letters in Rolling Rock’s ingredients – water, malt, rice, hops, corn, brewer’s yeast – adds up to 33. It’s related to the highest level status (33rd degree) attained by Freemasons. The workers at the brewery belonged to union local number 33. Though the Prohibition explanation does at first blush appear the most likely, it’s possible the 33 sneaked onto the label purely by happenstance. The “mistake” explanation doesn’t sound terribly convincing since the printer who sets and runs off thousands of labels before providing the customer with a proof copy to approve does so at his own risk. And even if someone from Rolling Rock had mistakenly approved the label design, error and all, there was no good reason why the errant ’33’ couldn’t have been removed from the copy before the next printing. So, the only real answer here is that no one knows the real answer. And perhaps that is the answer — after all, nothing helps sell a product like a little mystery.